When You Need a Little Christmas! 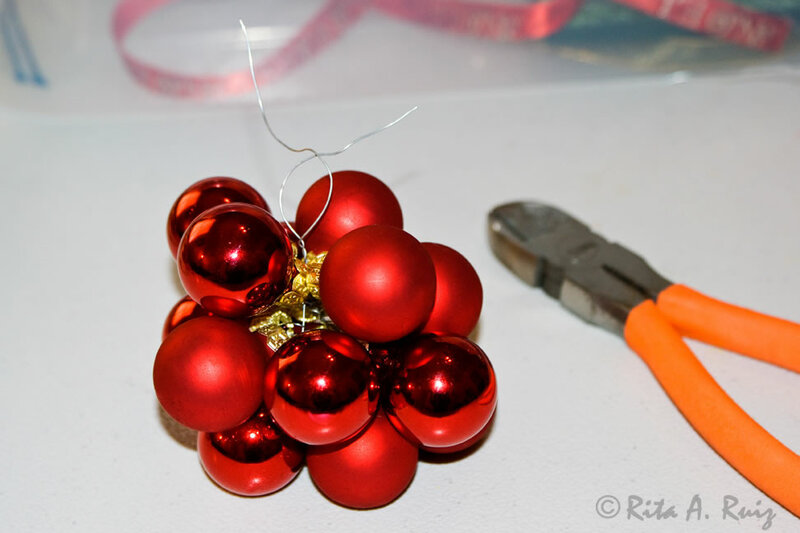 This time of the year makes me want to get my craft supplies out and make up all kinds of Christmas decorations and trinkets. 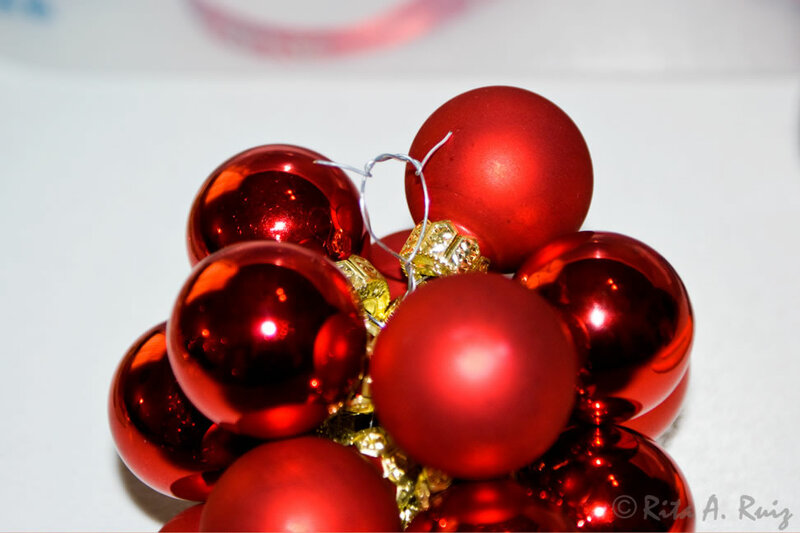 I bought a bunch of those tiny Christmas ball ornaments last year, knowing I would find something to do with them besides just stringing them on my tree. 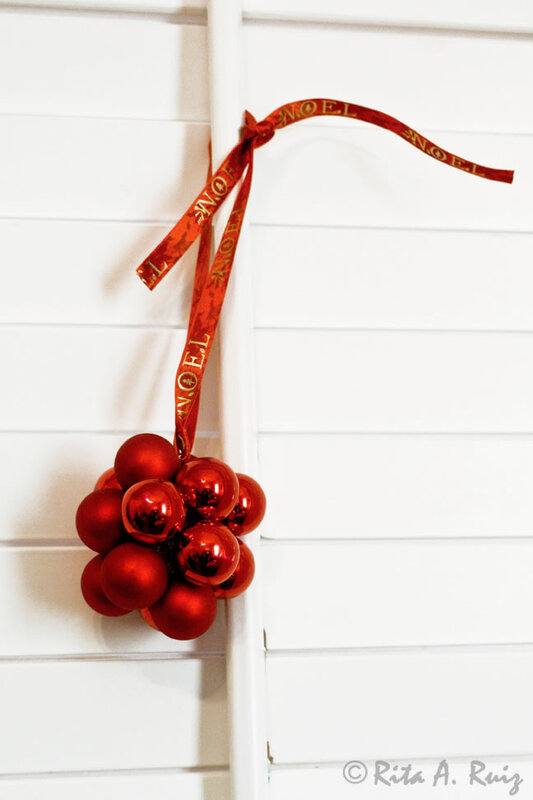 You can get them at any discount store for really cheap — which leaves you plenty left over to splurge on ribbon! 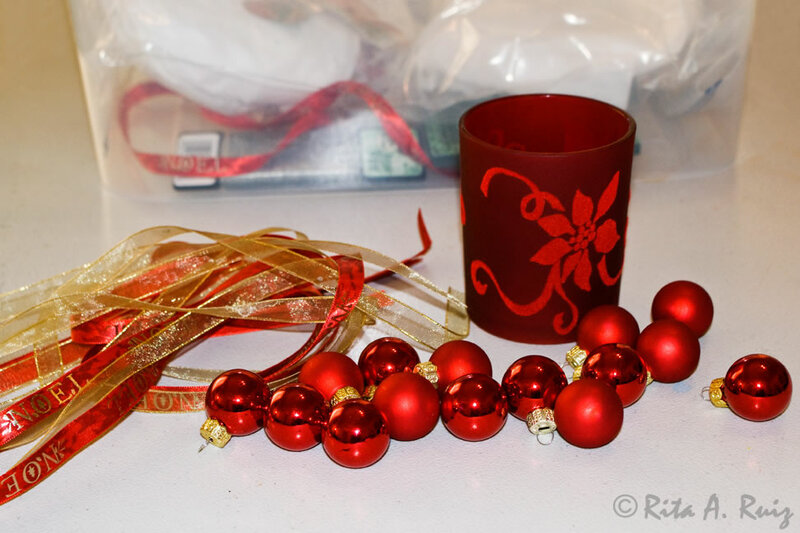 Buy a couple of small spools of ribbon about 3/8″ wide in brightly colored Christmas colors and motifs. 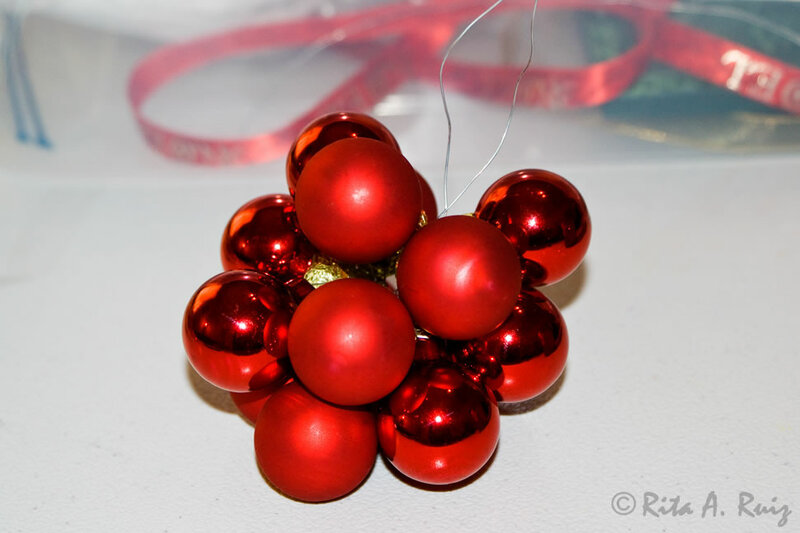 I used about 16 mini ornaments to make one finished ornament. Okay. Now start stringing the balls on the wire randomly. 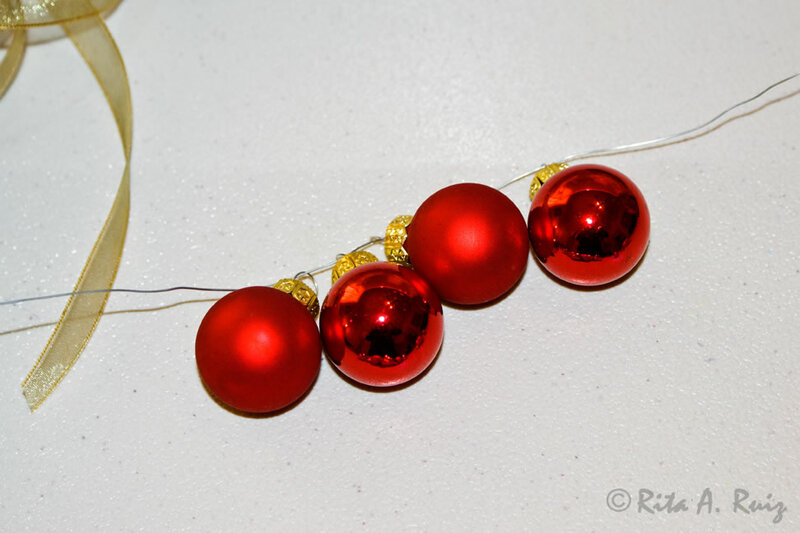 You don’t need to cut the wire yet, just string the ornaments. When you get about 15 or 16 strung on, pull up the wire gently so you don’t break any of the balls or pull them off their hooks. 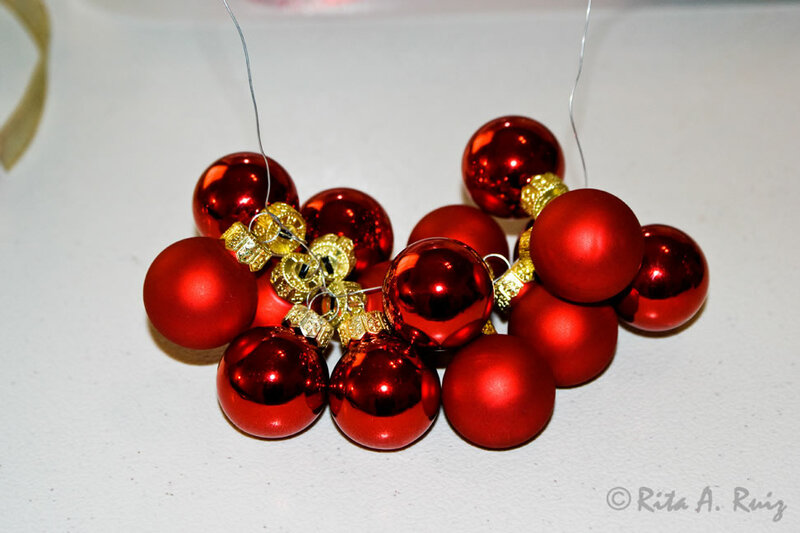 Now you can bring the wire together and give it one or two twists toward the bunch of ornaments. Then tie the loose end over and under the other end that is still connected to the spool of wire. Leave a decent amount because you need to make a loop in the next couple of steps. Start to form a loop and gauge about how much wire you will need to finish that loop off. Now you can cut the wire with your wire cutters. Using your hands, carefully start to wrap the wire ends around and around down the opposite sides of the loop you formed. When you get toward the ends of the wire, use your needle-nose pliers to wrap the rest of the wire around and down the loop. Pinch snuggly at the end so no one gets poked by a wire when handling. Now take your sweet little ribbon and pull through the loop you just made, pulling up to the length you want it be when hung, leaving extra for tying, and cut the ribbon. Tie a knot, leaving the two ends untied. Isn’t it so pretty just laying there like that?! Yes, I know. Crafts excite me like that. This entry was posted on December 6, 2010 by rtcrita. 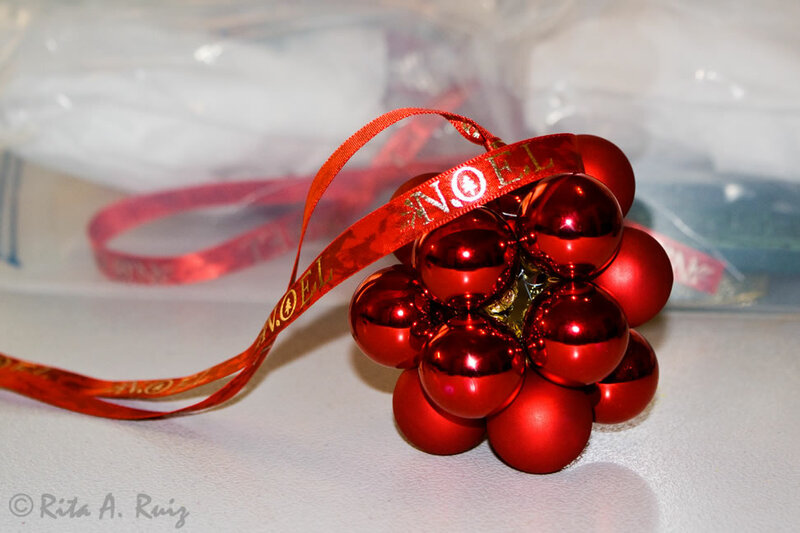 It was filed under Uncategorized and was tagged with Christmas ball ornament, Christmas crafts, colors, DIY Christmas ornaments, DIY craft projects, easy crafts, inexpensive crafts, photography, photos, quick crafts, ribbon. You don’t know the half of it! My house is full of yarn, sewing supplies, art paints, drawing pencils, fabric, embroidery threads, lampshade supplies, crafting papers, patterns, books….do I need to go on? Clever lady! Can’t wait to do this! How cool! 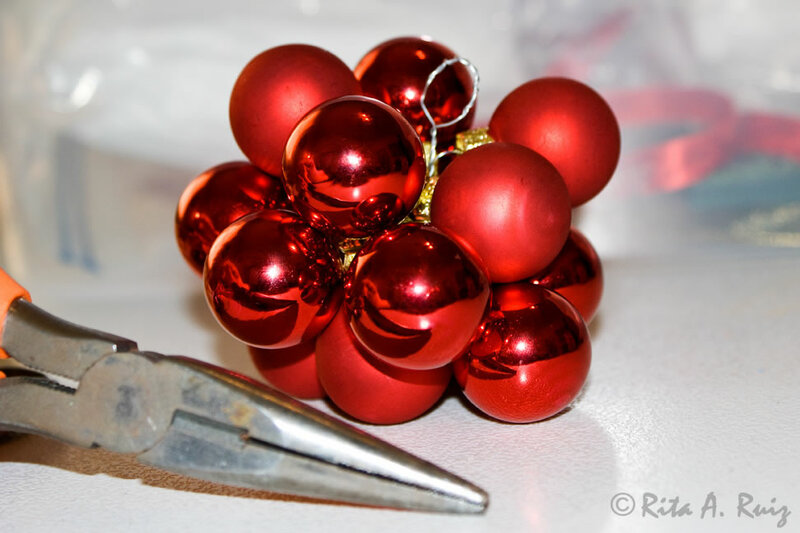 You can get those mini-balls for .50 at any dollar store, if you do the after Christmas sales! I like it. I think it can be used as one of those big ornaments for Christmas tree. You know,those that are hanged all the way down,on the lowest branches. 🙂 It’s really cute and so simple. Yes, you could use them like that. Anyway you like. Stay blogging this time! I checked your blog and liked the video of the guys on the treadmill. Cute! I love them. They are very creative and beautiful. I love that people use their hands and head to create something new things which cannot be purchased directly from shops. This winter my wife made many 3D stars by beading to her coworkers. I wish to You many creative hours!!! I love the ease of this craft. I always mean to do more than I actually get done. I think your collection of art supplies could be very similar to yours. Mine, I meant my collection is similar to yours. So, you have a messy house, too! Just kidding. I live in the smallest house I have ever lived in now and I don’t have my usual “spare room” that I use for crafts and sewing, etc. I just have to take whatever project out that I’m currently working on and use the dining room table or put up a card table in the living room (Which is never good, but whatever…crafts come first!) until it’s finished or I move on to the next thing. Thanks for stopping by! Come back anytime. Clever idea, rtcrita! Nicely done. Thanks, Todd! I love making things. You’re so talented! It’s not only the fact that you do these lovely things, but your instructions are clear and your photos are wonderful. That takes a lot of talent too. Could you just write stuff like that to me every day? It just makes my day to hear positive things about myself!!! I’m so needy, aren’t I? !